Creating Conversations That Matter® is a key skill for organisational leaders. Amidst forecasting, attending to meetings and writing reports, the development of this skill is often neglected. Think about it, how do you stimulate Conversations That Matter® with your peers, direct reports and your leaders? How do you stimulate them with your key stakeholders and clients? Conversations That Matter® are conversations where people are able to speak from the heart, speak their truth (whatever it may be) in a safe environment where there will not be negative consequences for speaking their mind. This does not mean that people lose responsibility for what they say. Rather, their responsibility increases as respect is a core requirement for a conversation that matters to be conducted. So how might a leader create a conversation that matters, especially when there may be a level of distrust present amongst team members? If you are able to follow the five practices above, then determine the focus of your conversation, then select an image that you could use and give it a go. As an example a great friend of ours Jock MacNeish has been creating such illustrations for the best part of his life. Over time Jock has created many illustrations for us and the 0 to 10 Relationship Management body of knowledge. As Licensed Elite Trainer Facilitators in 0 to10 Relationship Management, Andrew and I are able to use Jock’s illustrations. 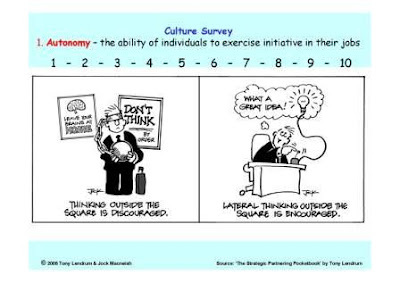 The 0 to 10 Relationship Management Culture Survey illustrations are very powerful catalysts for enabling people to have a conversation that matters. If you were interested to know what your team members thought about the level of autonomy that they had in their jobs, you could place the illustration below on the table and ask them to mark on the scale where they believe the level currently sits. When people place their finger on the scale that they believe represents their view, simply say, "Thank you for your honesty. What examples do you have that would help me to understand what this score means to you?" Their answers will be powerful and enable you to identify what you should keep doing, start doing and stop doing. If, of course, you have tried this technique and no-one in your team spoke up, then you may have your answer anyway! On the other hand if you've never tried this technique before please give it a go. Either print the illustration from this article or select a different onee for your team and create a conversation that matters. Please let us know how you go! Finally, if you like this concept but aren’t sure what illustration to use, please provide a brief description of your issue in the comments box and I’ll help you find an appropriate illustration. As a leader a significant part of your success is driven by your capacity to create and stimulate conversations that matter. Is this a skill that you possess? What are you currently doing to develop it? Please feel free to ask questions and/or to make comments about this article. You don't 'have' to do anything. Period.